From inter-faith to inter-cultural, life and love intertwined together has the power to transcend all barriers and boundaries. We here at SDE Weddings, Toronto’s premier wedding videography, cinematography and photo booth group, know this message all too well. So in working with Kristin & Tommy in filming their wondrous wedding day set on the bright summer day of July 5th, 2014, we are reminded of love’s lasting power to unite people, and just how paramount our passions can be in bringing people together. 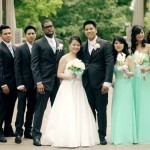 In an inter-faith ceremony of both Buddhist and Christian tradition, Kristin & Tommy, a Filipino and Vietnamese couple, were wed in a sentimental setting between their most precious loved ones, and held a lovely gathering at Markham’s Casa Victoria restaurant to celebrate and enjoy one of the most beautiful moments of their lives. We were privileged to spend their wonderful wedding day with them, and more so honoured to provide the full footage of their unforgettable day. Scroll further to learn more about Kristin & Tommy, their inter-faith and inter-cultural wedding, and the memorable marriage celebration afterwards. The momentous morning began for our videographers and cinematographers with a cross-cultural wedding experience. On the early morning of brightest of summer days, Kristin & Tommy had began their preparations for the long journey ahead. Kristin & Tommy, both long-time residents of Scarborough, only live a few minutes away from each other. So it was quite a charming gesture for our videographers and cinematographers to accompany Tommy, his groomsmen and their family and friends as they prepared the traditional wedding gifts for the bride, customary in Vietnamese culture, and brought them a stone’s throw away to Kristin’s doorstep in a quiet Scarborough suburb for a memorable morning’s first look. Covered in the traditional cloth ornamented in red and gold, Tommy’s family and friends carried the gifts one by one to Kristin’s home. Interestingly enough, one of the main gifts given was a whole roast pig (Heo Sua), which is also considered a Filipino delicacy (Lechon). 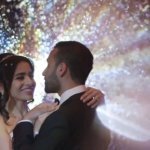 A beautiful and heart-warming scene captured by our videographers and cinematographers in the presence of their closest family and friends, Kristin & Tommy had a sentimental first look in the early morning, full of laughter and smiles shared between friends and loved ones on an ever auspicious day. 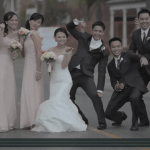 Once the wedding gifts changed hands and the families had greeted one another in full, Kristin & Tommy and their entourage, along with our videographers and cinematographers, took a lovely limousine ride to the groom’s residence. Greeted by Tommy’s relatives dressed in the traditional Vietnamese ‘Ao Dai’, the couple paid respects to Tommy’s ancestors in the family’s ancestral altar, a blessing for good luck and fortune for the future ahead together. Kristin & Tommy held their wedding ceremony soon after, in a humble observance set in Tommy’s backyard patio, which was elegantly and elaborately designed for the event. In a communal gathering of Kristin & Tommy’s shared loved ones, family and friend alike, the beloved bride and groom promised themselves to one another in a beautiful wedding moment captured by our videographers and cinematographers underneath a bright and cloudless summer sky. Ecstatic at their newly-formed eternal bond, the newlyweds Kristin & Tommy could hardly wait to stop by Toronto’s Alexander Muir Memorial Gardens for a lovely afternoon of photos and video-taking. With our videographers and cinematographers, Kristin & Tommy and their accompanying bridesmaids and groomsmen took many interesting shots throughout the garden’s greenery, some scenes of which can be previewed in the highlight reel below. Once the newlywed couple and their entourage had their fill of fun underneath the summer sun, it was time to have their fill in a gorgeous banquet specially prepared for them the Casa Victoria Restaurant in Markham, just north of Toronto. What’s interesting about Casa Victoria was that they have their own special wedding menu for wedding events, which made for an extensive menu of delectable delicacies specially prepared for the newlyweds and their family and friends. For their grand arrival, Kristin & Tommy made an enthusiastic entrance into the banquet hall, and were met with wide eyed applause. To welcome their guests and commemorate this momentous of monumental occasions, Kristin & Tommy had a special letter box open for their guests to send their well wishes to the newly-wed couple, as well as a lovely picture which the guests could sign their own congratulatory messages on its borders. Our videographers and cinematographers had also made sure to immerse our focus on Kristin & Tommy’s sentimental and romantic first dance, and their toast to each and every table of guests in attendance. As the evening grew long, Kristin & Tommy’s celebration just got more and more exciting and outrageous. Many light-hearted games, dancing, speeches and a slide-show of the couples’ precious pictures served as the centrepiece of the couples’ post-ceremony celebration. The evening winded down in energetic dance and song, making Kristin & Tommy’s unforgettable day one that finished on the highest of high notes. In the end, we here at SDE Weddings, Toronto’s premier wedding videography, cinematography, and photo booth group, wish Kristin & Tommy all the very best in their future together. We hope that our gift to them of their matrimonial memories captured in full will always serve as a precious token of their love for one another, and that the two would always keep the spirit of love and the energy of their wedding day within them throughout their lives.